In the spring of 2013, PETA investigators released this undercover video about the abuse that occurs in racing stables. Watch the video, then read the comments by equine expert, Holly Cheever, DVM. "The greatest number of incidents [horse deaths in the U.S.] on a single day — 23 — occurred last year on the most celebrated day of racing in America, the running of the Kentucky Derby. One Derby horse fractured a leg, as did a horse in the previous race at Churchill Downs. 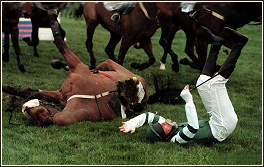 All told, seven jockeys at other tracks were thrown to the ground after their horses broke down. "A state-by-state survey by The Times shows that about 3,600 horses died racing or training at state-regulated tracks over the last three years." Watch the video at the beginning of The Times article. 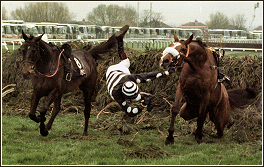 Animal Aid: "Every year around 300 horses are raced to death in Britain. To drive home the reality of Thoroughbred horse suffering and death, Animal Aid has produced a powerful 90-second web film. Most people regard horse racing as a harmless sport in which the animals are willing participants who thoroughly enjoy the thrill. 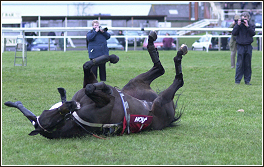 'Don't Back the Cruelty' shows a series of real on-course equine deaths." 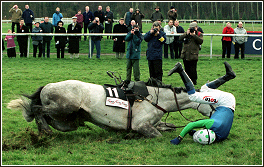 Although this particular video shows racing over jumps, racing on the flat also claims a great many lives. PETA investigators released this undercover video in 2011, showing horses as they were forced to run so fast that they suffered broken bones, burst aortas, and other potentially fatal injuries. Animals Australia: See what happens behind-the-scenes in the horse racing industry, and find out why you shouldn't bet on cruelty. 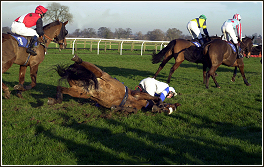 Many horses die on the track every year as a result of fatal accidents, among other reasons. This video documents a horrible collision between two horses who had no possibility of preventing it. 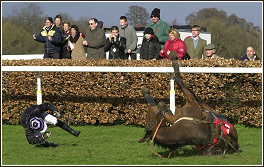 More cruel and unnecessary deaths, just for the benefit of the racing industry. This 17-minute video arises from a detailed report by Animal Aid about the use of the whip in British racing. Kentucky, the Thoroughbred capital of the world, is being overrun with thousands of horses no one wants. New laws are making it difficult to send horses off to slaughterhouses when they are no longer suitable for racing or work. 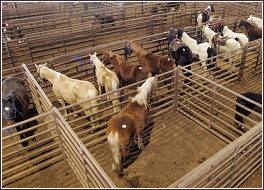 As a result, auction houses are being overrun with the animals and rescue organizations have more horses than they can take care of. Please watch the videos, then help our campaign against the introduction of the racing industry in Israel.